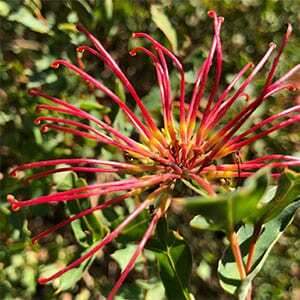 A small to medium shrub Grevillea maccutcheonii is commonly called McCutcheon’s Grevillea. Very attractive red spidery flowers and distinctive foliage give this species the reputation as being one of the best of all. Both flowers and foliage are standouts for the genus. In the wild, this is species that is endangered due to habitat degradation and disease, fortunately the plant is in limited cultivation. Good specimens can be found in a number of botanic gardens and hopefully it can be reintroduced into its native habitat. If you have a sunny position and a well drained soil this is a Grevillea that is well worth a try. It does like some moisture, however never wet soggy soils. Height – To around 1.5 – 2 metres. Spread To around 1.5 – 2 metres. Flowers – Red spidery flowers. 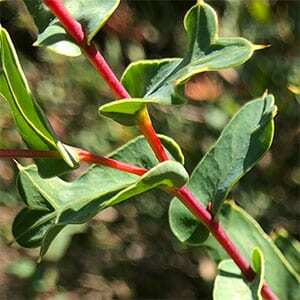 Foliage – The leaves are attractive and clasp around the stem in an interesting manner.